Apple has scheduled its keynote event for Monday 25th March 2019 which should be one of usually 3 events Apple holds per year. Here is a countdown clock to the event so you know when it starts where ever you are in the world. We will also provide details about the live stream and what to expect from the event. 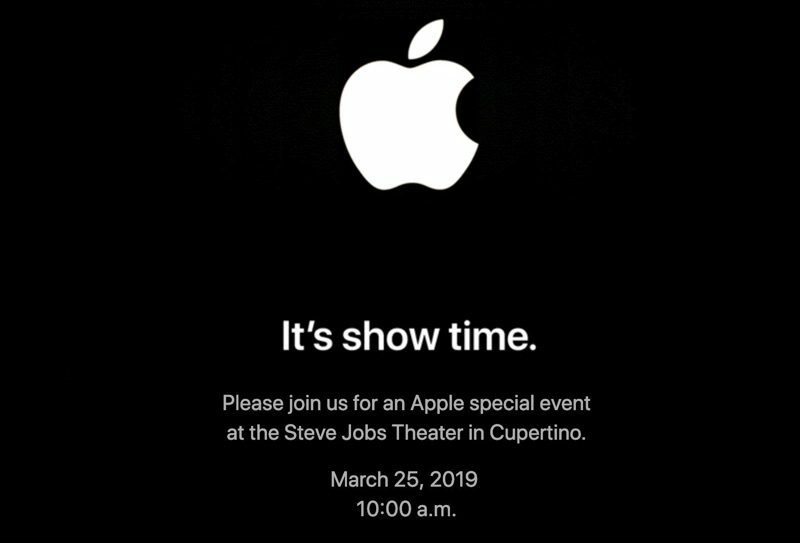 The March 25 event will take place at 10:00 a.m. Pacific Time (1:00 p.m. Eastern Time or 17:00 GMT) at the Steve Jobs Theater on the Apple Park campus in Cupertino California. Apple plans to live stream the event on its website and through the Events app on the Apple TV. Our speculations and conclusions are based on news items and rumors leading up to the event. These rumors suggest that Apple plans to focus on services at this event, introducing both a new Apple News service and a TV service. The Apple News service is a news aggregator outlet that Apple has been focused on these past few months. it will be a $9.99 per month subscription service that would give users unlimited access to stories from paywalled sites like The Wall Street Journal. The service will also include a magazine element, similar to the service offered by Texture, the magazine app that Apple bought in 2018. On the partnership front with news outlets, Apple wants a whopping 50 percent of all subscription revenue which some news outlets find too steep and won't be joining the platform. sites like WaPo and NYT won't join but magazine publishers are embracing Apple's plan. The news content and the magazines will all be accessible for a single subscription fee, thought to be $9.99 per month. Apple's push for services provision has also got them working hard on a streaming TV service that will include the more than two dozen TV shows and movies. It will also feature access to subscription content from other cable providers. Apple plans to allow its customers to sign up for services like HBO and Showtime right within the TV app, and the company could also provide channel bundles that aggregate content from multiple cable providers at a reduced price. There's no word on what this service will cost, but Apple will introduce it at the March event before launching it later in the year, perhaps in summer or fall. The iOS 12.2 beta program has been running for a while now and it seems iOS 12.2 is going to be ready for a March release. Apple is looking to release the iOS 12.2 update right after the event takes place to give people access to the new Apple News subscription service. Along with access to this subscription service, iOS 12.2 brings Apple News to Canada, offers new Animoji characters, includes HomeKit TV support for third-party TVs, and has dozens of other smaller tweaks and changes outlined in our iOS 12.2 tidbits post. According to Bloomberg, Apple is planning to preview new Apple Pay features at its March 25 event that will lay the groundwork for an iPhone credit card partnership with Goldman Sachs. It's not entirely clear what new features Apple will announce, but there are updates to the design of the Wallet app in iOS 12.2 that Apple may be planning to highlight. Rumors have suggested that the credit card that Apple is debuting in partnership with Goldman Sachs will have special features in the Wallet app unavailable to standard credit cards, such as budgeting tools, spending recommendations and limits, and more. Apple surely wants this event to be focused on its services platforms. Maybe for fear that hardware devices announcements might take away from the buzz of the services, Apple has been quietly releasing minor updates and refreshes to some devices we were whopping to see at the event. So far, Apple has released an updated iPad mini, a new 10.5-inch iPad Air, refreshed iMacs, and AirPods 2. A seventh-generation iPod touch and the AirPower could still be coming sometime soon. With Apple introducing hardware via press release ahead of the event, we aren't expecting to see any new hardware announcements at the event itself, but there's always the chance for a surprise.